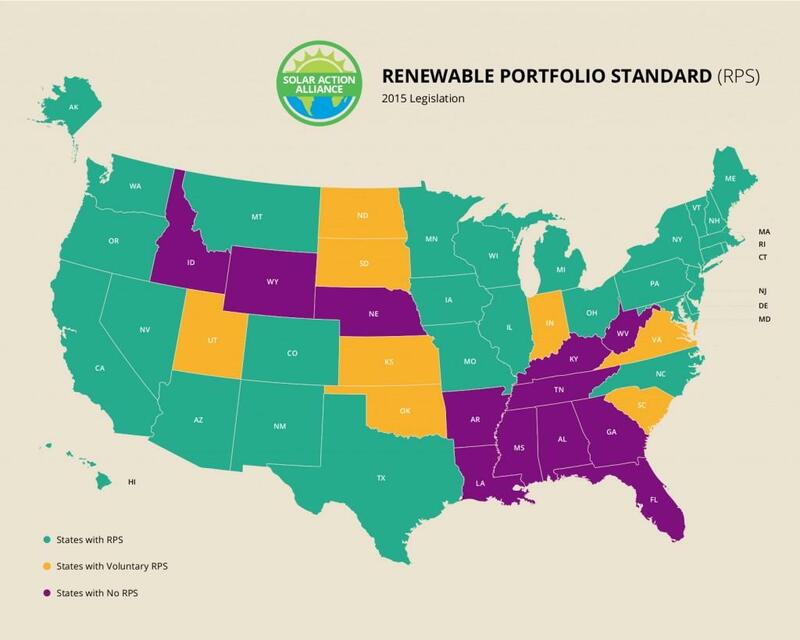 Montana is in the process of having some hopeful conversations about solar and other renewables, but still has a long way to go to finalize its Renewable Portfolio Standards. 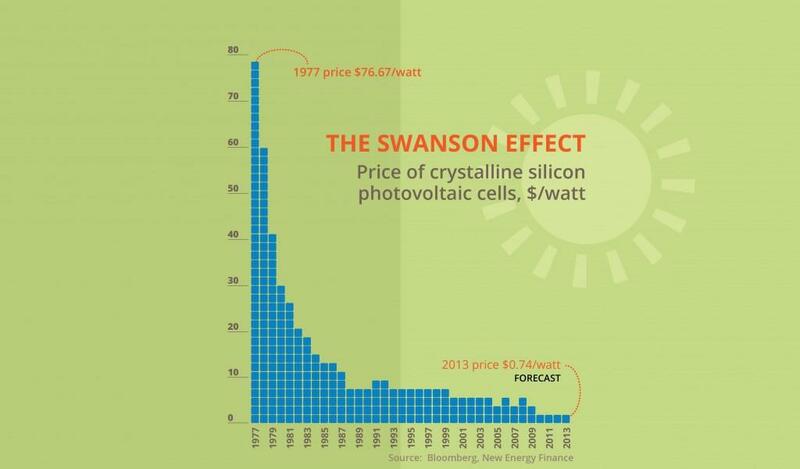 As the below Swanson chart shows, the costs of solar panels have dropped dramatically to a point where solar is a smart panel energy choice for Montana. With the RPS deadline coming up, there is a tremendous opportunity to enact some far-reaching, progressive energy policies to benefit the state and the environment for years to come. Let’s take a look at the different options available to Montana residents. 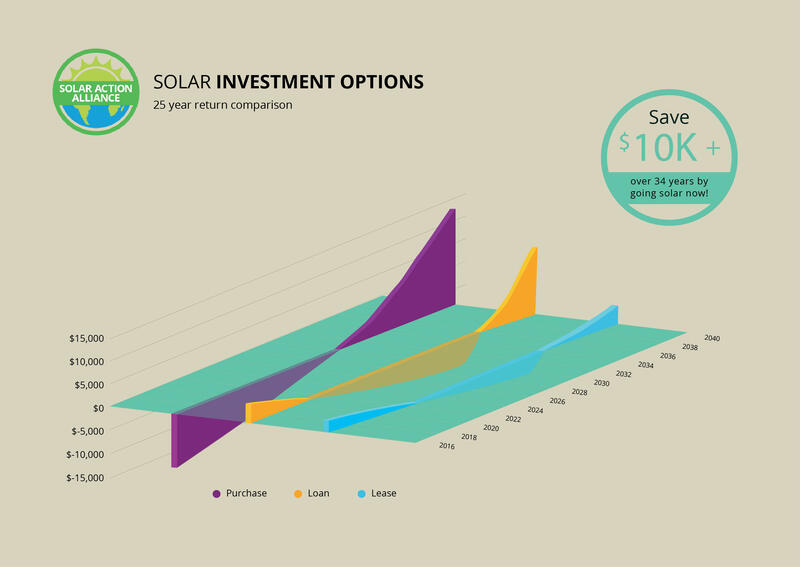 The chart below gives you an idea of the costs and returns for each solar panel system options available to Nebraska residents – purchase, purchase with credit, and small solar. Sadly, since there is no RPS in place, there is no solar panel lease program available in Montana at this time. Assuming you have the cash available, paying for your solar energy system up front will always maximize the value of the system and the returns you realize. With no monthly payments, you immediately start getting 100% of the cost savings. For this example, we will assume a 5 kW system with a cost of around $20,000. In Montana, in addition to a Federal tax credit of 30%, you get a state tax credit of $500 and a NorthWestern Energy rebate of $2000 on your system. To install the system should cost around $18,000 after the NEW rebate of $2000. After your Federal tax credit of $5400 and state credit of $1000, your initial investment is only $11,600! After your first year energy savings of around $650, you have discounted your solar system by around 45%. Those energy savings should pay for the remainder of the system in around 13 years, at which time you should be seeing $1300 per year in energy savings. 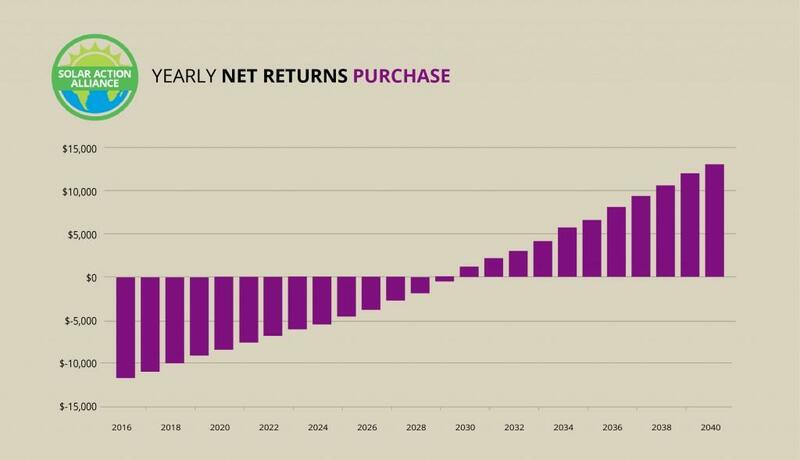 After 25 years, you will see a total return of about $13,700, or 6.2%. Not a bad return, and remember, you are providing good local jobs and saving the environment! For most people, paying for solar panels with a home equity loan makes the most sense. Because you are using a home equity loan, you not only get the 30% Federal credit, but you can deduct the interest on the loan as well. You get all of the benefits and incentives without any cash out of pocket. Let’s assume a home equity loan of 5% for an $18,000 solar panel system. While there will be a few years in the beginning where the loan payments are greater than the savings in energy costs, energy inflation will quickly outpace your loan payment. With an average $18,000 installation price, a purchase on credit makes perfect financial sense. Year one, you should have about $665 in energy costs, and have loan payments totaling about $1708. This means around $88 per month out of pocket your first year, but remember, you got $6400 in tax credits. That tax credit means you are $5347 ahead the first year! 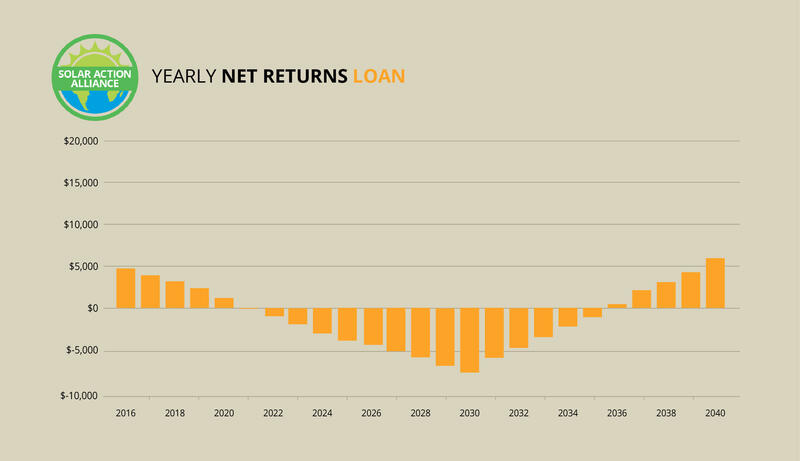 By year 15, when the loan is paid off, you will be realizing about $1100 per year in savings, and by year 25 your total net returns are around $6800, even after paying off the system! All of the numbers are similar to the example listed above, but around half the cost and half the savings. You can buy a small rooftop solar panel system (2kW) for around $7000 (after the great NEW rebate), and still receive the Federal and state tax credits and home interest deduction, as well as the energy savings, just on a smaller scale. Your first year, you should have an estimated energy savings of around $300. With loan payments of around $665, your money out of pocket is about $30 per month – but remember, you get the $3100 combined tax credit, and any credit you do not use this year will carry over to next year! After year 15, you should see around $450 per year in savings, while doing your part to conserve energy and resources, and your property values have increased around $6000. Montana’s RPS is being phased in over time, with increasing amounts of renewables required during each benchmark of the program. By 2015, Montana is requiring 15% renewable energy, and this is the final phase. While 15% is a good starting point, a goal of 30-40% renewables with a substantial part of that being solar is where the most effective states are mandating currently, so Montana has quite a bit of catching up to do. Montana has no “solar carve-out’. A solar carve-out is a guarantee that at least some portion of the energy generated will come from solar. This is the most glaring weakness in the state RPS, and should be fixed immediately! The relatively cheap energy prices in the state are no incentive for consumers to make the investment in solar. 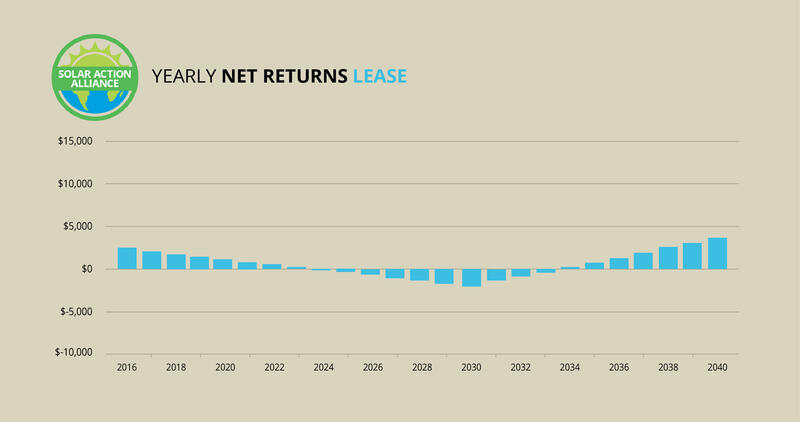 States with higher prices receive a more substantial immediate return. 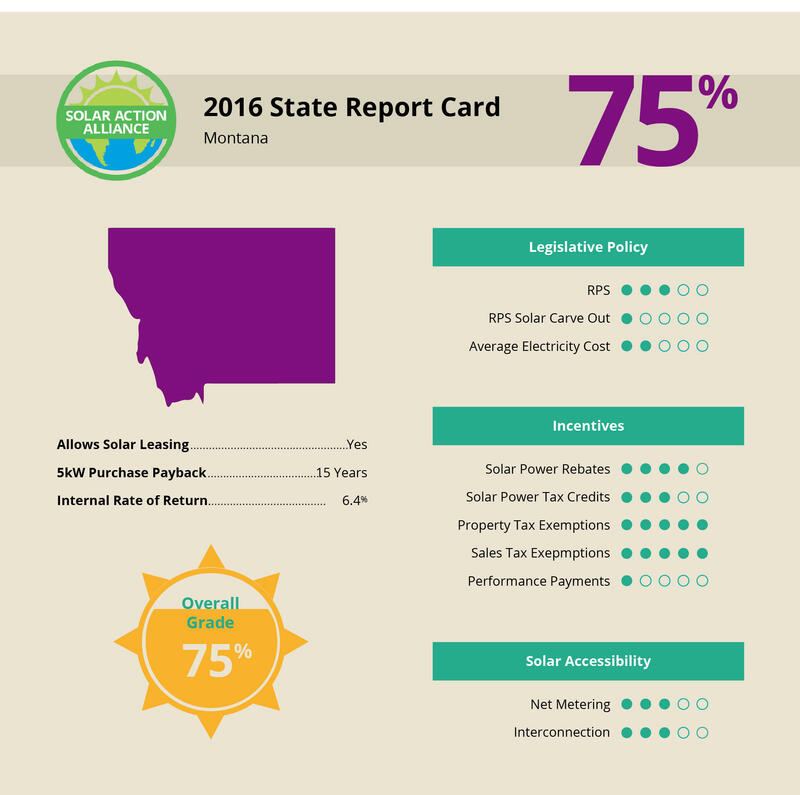 Solar performance payments, or rewards for production of solar power, are almost nonexistent in Montana. Net metering is statewide. Net metering means that any power you produce but don’t use can be sold back to the utility company for the same price they sell it to you. Unfortunately, this applies only to investor-owned utilities, and it is only a credit to your next bill. Montana has a mixed-bag Interconnectivity law, governing what utilities can charge or demand in return for you hooking up to the grid, and how simple it is to do so. It is fairly simple and cost-effective in Montana. There are terrific state tax credits and rebates in Montana, ranking it 10th in the nation. This makes the initial cost of installing a system extremely low in relation to the rest of the country. A state property tax exemption, as well as no state sales tax on solar panel energy, means that your total cost is lower than states that charge taxes on renewable energy systems. Even though Montana is a cold state, it actually has more net solar energy generation potential than states like Texas or Florida. This means that taking a few small steps, such as strengthening the RPS and a solar carve-out, could dramatically improve the energy situation in the state, as well as saving the environment for all of us.